Published September 13, 2017 By Leisa Good This post may contain affiliate links. Regardless, I only recommend sites I've researched and/or used and trust. Do people tell you that you have a nice, clarion voice? Have you ever had any voice training or done any public speaking? Are you looking for something more on the artistic side of the work-at-home industry? Well, then keep reading. There is now a section of the work-at-home population making money doing voice overs — especially as audiobook narrators. What Does Voice Over/Narration Work Involve? Usually when someone mentions voice overs it brings to mind cartoons or Disney movies, where celebrities use their own voices or one of their many “acting” voices to speak for the characters. Being able to perform voice overs is a combination of speaking, oral reading, and acting. All of this is done off-stage and off-camera, in other words “behind the scenes”. Voice over actors or artists are used in radio, television production, filmmaking, theatre, video games, eBook and audio narration and other presentations. For this post, we will primarily be examining eBook and audio book narration. What is the History of Voice Overs? As one can imagine, the history of voice overs has changed with technology. While many historians credit Walt Disney for doing the voice over of Mickey Mouse in 1928, the first voice over was actually done by Reginald Fessenden, a Canadian inventor. On Christmas Eve 1906, he used voice over to report the weather (using voice and music) for the US Weather Bureau. Today in 2017 even A-List actors want to do voice overs in between their acting gigs. If you haven't had any practice or previous training during voice over work, you might try these tips to break into the industry. Practice reading out loud, but make it sound as if you are NOT reading. Make a recording of your voice. Learn to breathe from your diaphragm instead of your chest. Try small parts acting in skits while staying in character. Take acting lessons or voice lessons. Overcome any regional accents or at least learn to hide them. What Equipment Will You Need to Do Audiobook Narration? It will really depend on how “full-time” you want to be and whether or not the equipment or recording studio will be supplied for you. One idea is to rent out a recording studio to do your own demo tapes, or even do some of the recording. This can get expensive as most recording studios charge by the hour. Laptop or PC for managing schedules, invoicing, tracking clients, and email. Smartphone for pulling up industry-related apps. Pair of studio headphones, which do not pick up the sound from your speakers or any background sounds. Mic stand to hold the microphone and free up your hands to handle the script. Pop filters, which block the initial popping and breathing when a mouth first encounters the microphone. Recording software (Audacity or othres) is free to hear a playback of your voice. Where Can You Find Freelance Work Doing Audiobook Narrations? If you have ever looked for freelance work on any of the bidding sites, you have probably seen voice over artists advertising their skills on Fiverr, Freelancer, Upwork, and Guru.com. No surprise there, especially given how many eBooks are out there as well as audiobooks. ACX.com – On this site you will have opportunities to connect with authors seeking voice over artists to audition for their eBooks and audiobooks. ACX also helps both authors and narrators promote themselves on social media and offline as well. There are additionally opportunities to find and use agents for your talents and earn royalties both as an author and voiceover artist. There is an easy search tool that makes it simple to find posted jobs. Voicebunny.com – This is another site where you can advertise your voice over talent and find jobs in several venues such as advertising, presentations, movie trailers, product videos, video games, eBook and audiobook narrations, and many more opportunities. The only drawback with this site is they do want experienced voice over artists, so if you are not there yet, you might want to hold off on this site until you are more experienced. Voices.com – Read Voices.com Review – This is a site that was co-founded by Stephanie Ciccarelli who has been trained in voice, piano, and musical theatre. Voices.com offers helpful advice for both eBook and audiobook authors as well as the voice over artists themselves. While this site does have job postings, it seems to be just as focused on helping you learn to find your own clients as well as keep up on the latest industry news. How Much Can You Make Doing Voice Overs In General? This will really depend on how well you are known as well as your portfolio and experience. Also, you will really need to pay attention to the sound quality of your voice overs before submitting them. On sites like Fiverr.com and freelance bidding sites, you may not make much money starting out, but you will build the experience, practice, and portfolio you need. The going rate for most freelance work (unless you are a celebrity) is $20 to $33 an hour. How Can One Go Ahead and Launch a Freelance Career Doing Voice Overs and Narrations? As always, do your own homework and decide if this is something you really want to do. While it does take a while to build any freelance career, this one involves setting up a recording studio with equipment if you want to eventually do it professionally from your home. That could run into a significant amount of money. 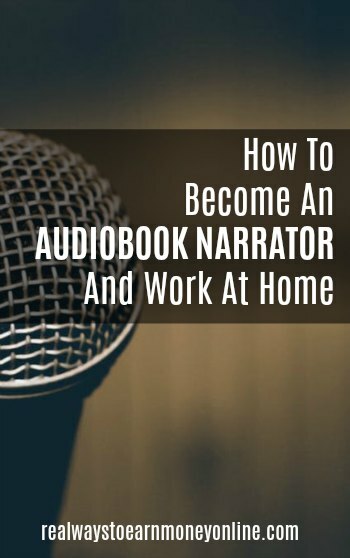 However, if after weighing all the options, you are still excited by the whole idea of recording audiobook/eBook narrations, then go right ahead. Good luck to all who pursue this exciting opportunity. Never heard of this freelance option, but I guess with audio books becoming all the rage, there is demand. Wow, this post is packed with great information and resources. Thanks for telling us about this opportunity and for showing us how we can get started. And the fact that we can work from home is all the sweeter! Passing this along. Have a great week! Thanks, Cori. You do the same.